Each artwork is shaped by the story it contains. 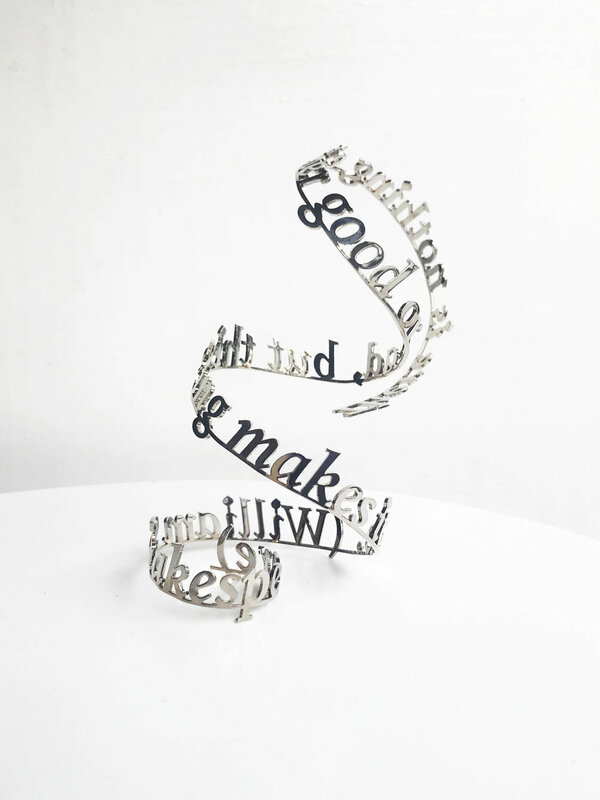 Nicola Anthony is a text artist creating metal sculptures large and small, which fill space with words, stories, secrets and life testimonies. Her material can be steel, gold, or toughened metals, woven into the delicate forms of words suspended inside bell jars, glass vessels, or even suspended from the ceiling as if levitating. The metal sentences come together, reflecting the viewer's face in the high shine surface, projecting their shadows into the surrounding space, and telling the story of human lives as they twist and turn. Each of Nicola's works is shaped by the story it contains - multilayered, fragile, suspended in time. These personal pieces are often commissioned to tell a life story, a verbal portrait, or a significant phrase or quote. In similar works commissioned for museums and art institutions, Nicola's process of capturing unheard voices has led her text sculptures to navigate topics such as: social and political undercurrents in Myanmar, Singapore, SouthEast Asia; Narratives that pierce through time to WW2 such as Holocaust survivors testimonies and stories that are found in the porous surfaces of London’s bombed buildings; and individual untold stories from disenfranchised communities. Get in touch to collaborate or commission.